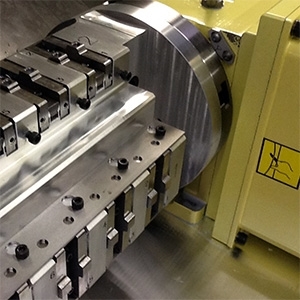 TWM Technology is a leader in the design and manufacture of high-end hermetic metal packages and components. Their 30-year pedigree and continuity in management ensures that in-depth knowledge and experience is at the heart of what they do, providing customers with total solutions, from design for manufacture to delivery of precision products within strict deadlines. Jez Pring, TWM Engineering Manager, approached NIKKEN Kosakusho Europe Ltd. to investigate a way of improving production processes to fulfil increasing volume requirements of one of their customers. The process in question involved the loading and machining of a complex component, requiring 12 tool changes, one part at a time. This particular operation required an operator to be present to load and unload each part, using valuable machine tool capacity. Looking at the different options open to TWM the decision was made to adopt a multi-load approach to try and reduce the operations needed to complete production. Knowing NIKKEN’s reputation for quality and accuracy TWM invited Andrew Bould, Nikken's Advanced Manufacturing Engineer, to come and discuss the options available to aid TMW improve all aspects of the machining process. CNC202 Rotary Table with TAT170N and trunnion fixture set up. The approach taken was to analyse where savings could be made and design a solution to maximise efficiency with no compromise in component quality. Andrew visited TMW and collaborated with them to develop the optimum solution, this being a CNC202 Rotary Table complete with a TAT170N and trunnion fixture set up. This was a real team effort, with Andrew supplying the initial principle and Jez designing the work holding - when put together this enabled multi loading of the parts, reducing the number of operations, with the required process advancements required being met and exceeded. Before implementing the multi-load approach each component took on average 16 minutes each to manufacture using a fully manned procedure, with a typical daily production rate of 28 units. After the multi-load approach with the CNC202 Rotary Table and trunnion was implemented the average machining time per part dropped to 2.5 minutes, with the daily production rate now at 216 parts. In addition to the increased production throughput the new approach has resulted in 14 hours unmanned machine tool utilisation, freeing up a skilled machinist to attend to additional operations within the workshop. Reflecting on the project, Jez commented “Working with Andrew Bould and NIKKEN to design the optimum solution for our needs has had a huge impact on productivity for this application. Relying on NIKKEN’s established expertise and unmatched product quality, together with TWM’s application knowledge has resulted in an unbeatable partnership that is sure to work together on future projects”. TWM Technology is part of The Eurotech Group plc a group specialising in electronic products including printed circuit boards (bare and assembled), cables, wires, and metalwork. They conform to the latest quality standards, and carry EN ISO9001:2008 approval. They operate a fully-equipped test and inspection facility, and manufacture both from common metals and highly specialist elements utilising glass-metal and ceramic-metal technology.